Southpointe Dental in Red Deer provides crowns and bridges as a common dental treatment to contribute to the health and appearance of your smile. If you are interested in Dental Crowns & Bridges, call us today. 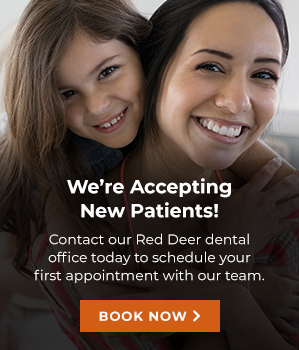 Our family dentists in Red Deer will examine your mouth to see if you are a candidate for a dental crown or bridge. For bridges, we will check that you have enough bone tissues to support a bridge. Digital X-rays will be used to get a complete look at your oral tissues. If you are a good candidate, your anchoring teeth will have to be reduced in size to prepare placement for the dental bridge. The dental bridge is created using digital impressions of the teeth. This process provides a faster and more accurate way to create your custom-made dental bridges.